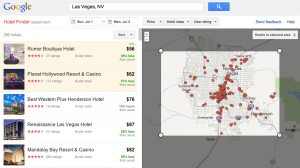 Google’s “experiment”… Hotel Finder recently had a face-lift, and we really like what they’ve done with it! First though, because we get this question often, Google refers to Hotel Finder as an “experiment” because they are actively tweaking and improving it…but it is NOT going away. Even Google is not going to pay 700+ Million for a piece of software that almost instantly allows them to compete with meta-search engines only to walk away from this enormous ad referral opportunity. 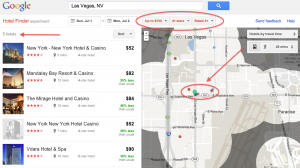 Google’s Hotel Finder is here to stay, and will continue to improve – so hotels…you need to get your rates and inventory loaded on this channel so you can compete fairly with your OTA partners that are also promoting your hotel. Although it may sound like we are anti-OTA we are definitely not. We’ve worked on the hotelier side for many years and truly believe that the billboard effect and marketing reach OTA’s provide is exceptional and necessary for almost every hotel. However, we do believe in leveling the playing field and giving hotels the same opportunity to convert a user searching on Google into a customer. Filters on top of screen are used to narrow your search preferences. Green bubble on map can be moved to mark users specific location where they want to be near and search hotels within X distance. We expect for Google to continue to make enhancements to the Hotel Finder tool, as well as eventually remove the “experiment” tag, but only Google will know when they are ready to do so. Until then, we’ll continue to update you on enhancements and travel related releases.